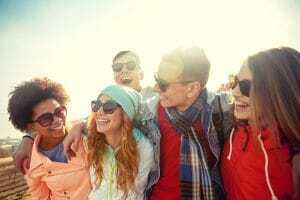 Eye Care | Can Cheap Sunglasses Cause Eye Damage? Can Cheap Sunglasses Cause Eye Damage? Sunglasses are an important aspect of your eye care routine year-round! Even though the temperature may be cooling off, the sun’s rays can still damage your eyes and can even have a more severe effect in the winter, as the rays can be more reflective if there is cloud cover. But did you know that even if you wear sunglasses, your eyes may still not be protected? Learn more about the dangers of wearing the wrong sunglasses. rays—If your sunglasses do not block out both UVA and UVB rays (the two most damaging sun rays), you may even be doing more damage to your eyes than going without sunglasses at all. Because sunglasses block some of the sun and allow your pupils to dilate more than they would by squinting, you are actually letting more of the rays into your eyes by wearing sunglasses. Sunglasses that block out UVA and UVB rays will protect your eyes and are an important measure for your eye care, as sunglasses that do not block harmful rays can actually let in those rays and damage your eyes. Even if you wear UV-blocking contacts, you should still wear UV-blocking sunglasses—Your contact lenses may not offer 100% protection, so it’s still a good idea to wear UV-blocking sunglasses. This way, you can also wear these sunglasses without worrying if you take your contacts out or change lenses. Cheap sunglasses may not match your prescription—If you wear glasses, you will want to make sure that your sunglasses are prescription lenses. If you have been wearing sunglasses without a prescription, your eyes may have a difficult time adjusting, and you may cause unnecessary strain on your eyes. Treat your eyes right by protecting from the damaging rays of the sun! To learn more about our eye care tips, or to schedule an annual eye exam with an optometrist at Valley Eyecare Center, call (602) 955-2700, or visit our website.